New York Gov. 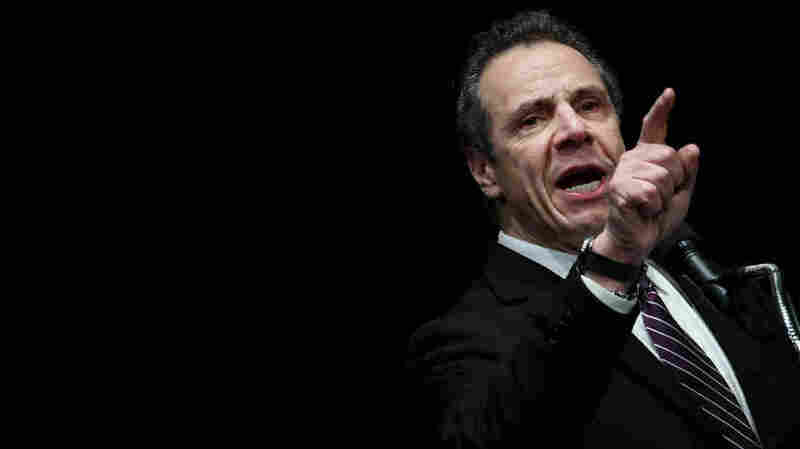 Cuomo To Federal Immigration Officials: 'The State Will Sue' On Wednesday, the governor sent a cease-and-desist letter to U.S. Immigration and Customs Enforcement, saying its arrest of a dairy farmer in upstate New York last week violated the law. New York Gov. Andrew Cuomo speaks at a health care union rally at the Theater at Madison Square Garden on Feb. 21. Cuomo is threatening to sue federal immigration authorities and accused them of violating the law. New York Gov. Andrew Cuomo is threatening to sue federal immigration authorities over their aggressive tactics. Cuomo sent a cease-and-desist letter Wednesday to Immigration and Customs Enforcement. "We believe ICE is violating the law," Cuomo said at a press conference. "We're going to put them on notice today, if they continue, the state will sue them. Period." In response, ICE Deputy Director Thomas Homan accused Cuomo of "grandstanding" and called his comments "inaccurate and an insult to ICE's sworn law enforcement officers." Cuomo's threat follows an ICE operation that netted more than 200 arrests across New York City and surrounding counties — and one raid at a dairy farm near Rome, N.Y., that is drawing particular scrutiny. The dairy farmer, John Collins, attended Cuomo's press conference. Collins says he was standing outside his dairy barn last week when armed ICE agents stormed onto his property to arrest a Guatemalan immigrant who worked for him. "They did this without a warrant. After they entered my property, they did not identify themselves," Collins said. "Officers showed no respect for me, my employees or the rule of law." When he tried to document the arrest using his phone, Collins says, the officers tossed his phone away, placed him in handcuffs and threatened to arrest him. "This man is an incredible hard worker who plays an important role on our farm," Collins said. "The federal authorities had no reason to take him from my farm, and from his family." ICE identified the arrested man as Marcial de Leon-Aguilar, an undocumented immigrant from Guatemala. According to ICE, de Leon-Aguilar has been removed from the U.S. three times before and has past felony convictions for aggravated assault and illegal re-entry. Homan says ICE agents "acted professionally and within their legal authorities under federal immigration law" when they arrested de Leon-Aguilar. "ICE going on to the farm without a valid warrant violated constitutional rights," Cuomo said. "We believe ICE is acting beyond the law."